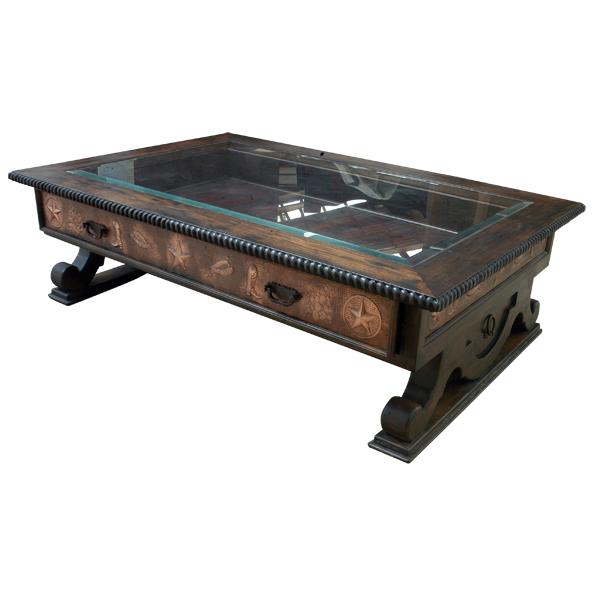 The blend of glass and copper on this gorgeous, handcrafted, Western style coffee table create a radiant design. The coffee table has a wide, rectangular top, and the top features a beautiful, rectangular glass panel with beveled sides. The glass panel is bordered by the finished wood of the top. The top rim of the coffee table is adorned with a hand carved, twist rope design, and below the top rim is a wide, rectangular drawer. The front of the drawer is embellished with a hand hammered copper panel, and the panel is enhanced with hand tooled copper, Western designs. 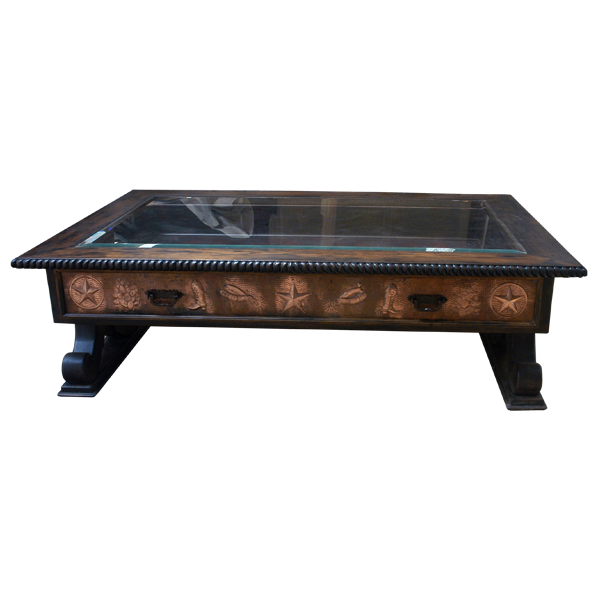 These hand tooled copper designs are continued on the lateral sides of the coffee table. The drawer also has a hand forged, iron handle on each of its sides. The coffee table is supported by slightly splayed, hand carved, scroll legs, and each scroll leg rest on a solid wood panel with a staggered rim. It has an antique finish, and it is made with the best, sustainable, solid wood available. The coffee table is 100% customizable.